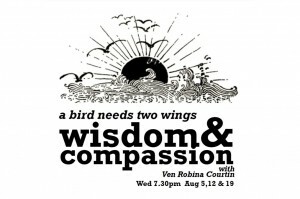 Compassion is the point of a spiritual path but, as His Holiness the Dalai Lama says, “compassion is not enough, we need wisdom.” This means we need to know ourselves deeply and well by understanding the law of karma – that we create our reality – and understanding our mind, therefore gradually becoming less fearful, less attached, less angry. This enables us to empathize with others and to gradually develop the courageous compassion to help others. Last session was held on 19 Aug. Bookings are now closed. Click here to listen to audio recordings of these sessions.